If you ever wanted to write a large program or software, the most common rookie mistake is to jump in directly and try to write all the necessary code into a single program and later try to debug or extend later. This kind of approach is doomed to fail and would usually require re-writing from scratch. So in order to tackle this scenario, we can try to divide the problem into multiple subproblems and then try to tackle it one by one. Doing so, not only makes our task easier but also allows us to achieve Abstraction from the high-level programmer and also promotes Re-usability of code. If you check any Open-Source project from either GitHub or GitLab or any other site of the likes, we can see how the large program is “decentralized” into many numbers of sub-modules where each individual module contributes to a specific critical function of the program and also various members of the Open Source Community come together for contributing or maintaining such file(s) or repository. Now, the big question lies in how to “break-down” not theoretically but PROGRAMMATICALLY. We will see some various types of such divisions in popular languages such as C/C++, Python & Java. Let us assume we have all the basic Linked List insertions inside one single program. Since there are many methods (functions), we cannot clutter the program by writing all the method definitions above the obligatory main function. But even if we did, there can arise the problem of ordering the methods, where one method needs to be before another and so on. We can already see the underlying problem(s) with the program, the code is not at all easy to work with, neither individually nor in a group. Need to go through the Full source file to improve or enhance some functionality. Cannot easily re-use the program as a framework for other project(s). Code is very cluttered and not at all appealing making it Very Difficult to navigate through the code. In case of group project or large programs, the above approach is guaranteed to enhance the overall expenditure, energy and failure rate. We see these lines starting in every C/C++ program which starts with “#include ”. This means to include all the functions declared under the “library” header (.h files) and defined possibly in library.c/cpp files. These lines are processed by pre-processor during compilation. We can manually try to create such a library for our own purpose. “.h” files contain only Prototype declarations (such as Functions, Structures) and global variables. Use static functions to restrict to the file where they are declared. Use extern keyword to use variable(s) that reference external files. If using C++, be careful about namespaces always use namespace_name::function() to avoid collision. Looking into the above program, we can see how this large program can be divided into suitable small parts and then easily worked on. 1) Create, Insert and store data into Nodes. 1) Main File -> Driver program, Nice Wrapper of the Insertion Modules and where we use the additional files. 2) Insert -> The Real Implementation Lies here. The reason we write our declarations in between the #ifndef, #define and #endif is to prevent multiple declarations of identifiers such as data types, variables etc. when the same header file is invoked in new file belonging to the same project. insert.h -> Contains Node insertion’s declaration and also declaration of Node itself. One very important thing to remember is that compiler can see declarations in header file but if you try to write code INVOLVING definition of the declaration declared elsewhere, it will lead to error since compiler compiles each .c file individually before the proceeding to the linking stage. linkedlist.h -> A helper file that contains Node and it’s Display declarations that is to be included for files that uses them. insert.c -> Include the Node declaration via #include “linkedlist.h” which contains the declaration and also all other definitions of methods declared under insert.h. 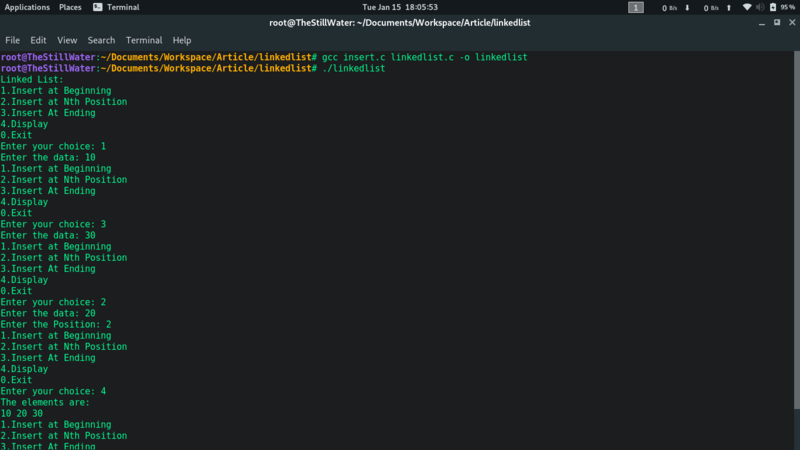 linkedlist.c -> Simple Wrapper containing an infinite loop prompting user to Insert Integer data at required position(s), and also contains the method that displays the list. One final thing to keep in mind is that, mindless including files into each other may result in multiple re-definition(s) and result in error. Keeping the above in mind should you carefully divide into suitable sub programs. // standard library files later. Finally, we save all of them and compile as follows. It remains mostly same for C++ keeping aside usual language feature/implementation changes. Here it is not so difficult. Usually, the first thing to do is to create a virtual environment. It is a must in order to prevent breaking of a bunch of scripts due to various version dependencies and such. For eg, You might want to use Version 1.0 of some module for one project, but this latest version deprecated a feature that is available in 0.9 and you prefer to use the old version for this new project or simply you want to upgrade libraries without breaking old and existing projects. The solution is an isolated environment for each separate project/script(s). This is done in order to treat the directory as containing package(s) and access sub modules inside the directory. 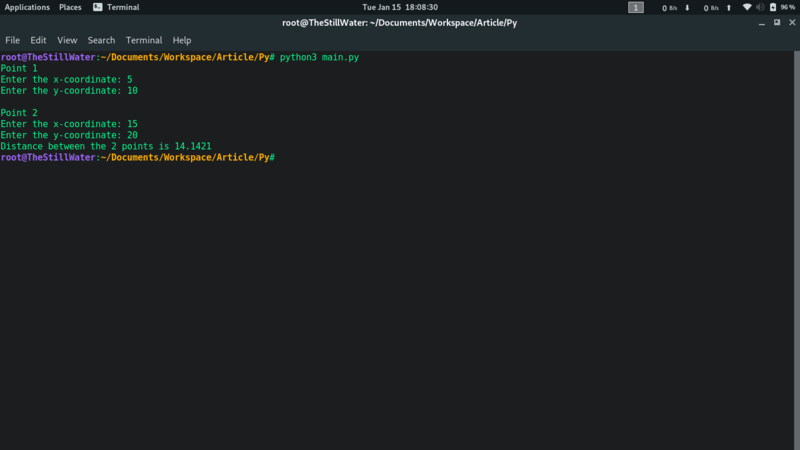 If you don’t create such a file, Python will not explicitly look for sub-modules inside the project directory and any attempt to access them gives an error. The First line allows you to access references via module.feature() or module.variable. The Third line allows you to access all references directly. eg: feature1(), feature2() etc. The weird looking ‘if __name__ == “__main__”:‘ is used to prevent execution of the code under it when imported in other modules. We can simply abstract the Point Implementation to a separate file and use a Main File to fulfill our exact requirement. 1) Main File -> Driver program, Create, Manipulate and use Objects. 2) Point File -> All the methods we can define using a Point in the Cartesian plane. Helper.py -> Which consists of a Point class that contains methods such as distance and also it consists of init method which helps auto-initialize the required x and y variables. Main.py -> Main Program that creates 2 objects and finds the distance between them. On the starting line, and create a class as usual. The 1st and 2nd ways of look similar to python’s from…import syntax but you have to explicitly state the class. In order to achieve such a not recommended but pythonic way of from…import syntax style, you have to use the 3rd method i.e., import static to achieve similar results but you have to resort to using fully qualified name to prevent collisions and clear up human misunderstandings anyway. 1) Main File -> Driver program, Write the Manipulative code here. 2) Math File -> All the methods regarding Mathematics (here Partially implemented Check Function). Math.java -> Which belongs to foo package and a Math class that consists of method check which can only compare 2 nos. excluding inequality. 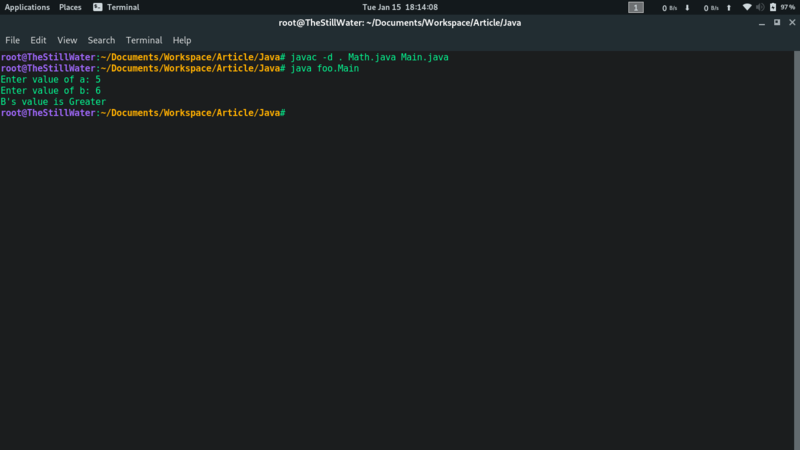 Main.java -> Main Program takes 2 numbers as input and prints the greater of 2.